This is my second homework for Path of Practice. Last month I wrote about generosity, this month it's about kshānti, or patience. Last Sunday I visited my grandmother. She's in her 90s, and each month I see her, her mind is a little more gone than the last time. It's remarkable how steadily she declines. Just when I think she's gone so far she must be bottoming out, she loses another ounce of her faculties. I brought some sushi and salad for lunch. As I maneuvered her into her seat at the dining table she looked at the salad and forgot she was in the process of sitting. She reached into the salad, grabbed a cherry tomato, and turned it one way and another, trying to remember what it was. I'd never seen her do anything like that before. She seemed never to have experienced sushi, either. When I wasn't watching she picked up a lump of wasabi and tried to eat it. She spat it out and looked at me pleadingly, but also with humor. Her face seemed to say, "I was just sitting here and look what an awful thing happened to me. How funny!" Her eyes teared up and her nose ran. She didn't know why she felt so strange. She pulled her shawl around her, thinking she was cold. For my homework on kshānti I'm writing about Grandma, because it's with her that I'm most patient. I don't claim I'm a perfect grandson. Now that being with her is harder than it used to be, I visit less often, and there's a buildup of impatience that I have to release in some way afterward. But for the most part, when I see her, I accept each new small duty that results from her descent, like preventing her from eating the wasabi. It's easy for me to offer patience to someone who's a model of patience herself. Grandma's endured more than most. She was an active artist from her 30s onward, but her career in each medium was cut short by arthritis. She began working in stone, and when the chisel was too painful to use she could still paint and weave, until using the brush or sitting at her loom's bench hurt too much. Her best work was the stone. She'd see an animal, or a man, or a mother and child in a big smooth stone, and carve the minimal line to bring out what she saw, so others could see it. 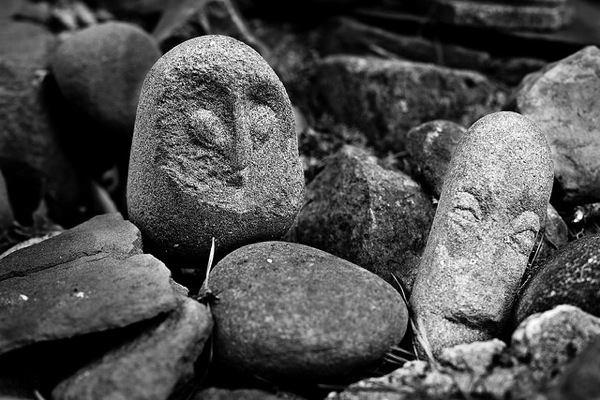 A few long grooves in the stone, and out popped a lamb or a frog. Now she's headed the other direction, losing details, smoothing out. 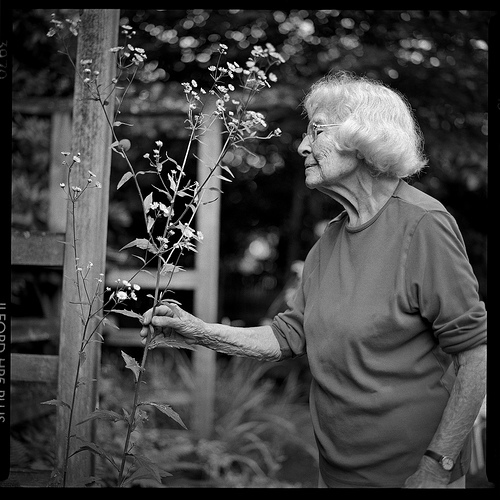 She used to tell me the names of the flowers in her garden: gladiolus, rhododendron, hepatica. A few years ago she forgot them all. She could only point at her flowers and say, "What an extraordinary area!" Last spring she forgot she was the one who'd planted them. She was delighted to see them. "It just came by itself, I didn't do anything." And last Sunday as we walked slowly, slowly around the garden, all she had left to say was, "Let's look at that," and, "Beautiful!" Grandma is so patient about her losses that I have no trouble being patient with her. Even though I had to sit with her for an hour eating lunch, periodically reminding her that she had food in front of her and should eat some. Even though it took us an hour to walk 50 feet into the garden. When we turned back toward the house Grandma couldn't get up the stony path—she was strong enough to walk up the incline, but she couldn't figure out how to place her feet among the rocks. I took her elbow and led her the long way around to the house. Her steps were so short we hardly moved at all, more rocking side-to-side together than walking forward. We slow-danced around the garden to the house. Grandma didn't complain and neither did I. For her, part of her patience is that she doesn't know what's wrong. She can't decide if her experience is bad or just strange. A baby can feel without knowing, but not an adult, and although she must be watched like a child Grandma is very much a grownup. If she isn't sure something terrible is happening, she usually tries to keep a good face on things. She'll exclaim from time to time that a fork is too heavy, or a cup too cold, but the great losses—her independence, her ability to read, to talk—go mostly unmentioned. And if Grandma can live patiently through a day stripped of everything that makes it worth living, I can cheerfully walk her around the garden before I go home.